Successfully Added Ulefone Power Smartphone - 64Bit Octa Core CPU,3GB RAM, 6050mAh Battery, 5.5 Inch IPS Screen, Android 5.1, Dual SIM 4G (White) to your Shopping Cart. The UIlefone Power has been designed in house and by Ulefone and features a solid metal case built around the 6050mAh battery, with some high end specs and a beautiful finish the all for under $200 the Ulefone Power is a real winner. 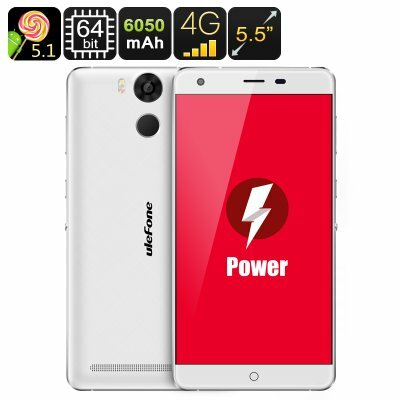 With its 5.5 IPS inch screen the Ulefone power falls into the Phablet category and brings a large, sharp image in full HD resolutions. The screen has a wide viewing angle and with its 2.5 Arc curved glass screen is easy to see and touch, what's more the 1920 x 1080 resolutions lets you appreciate every detail of movies and games. Protected by Corning's Gorilla Glass 3 this screen is well protected from accidental damage such as scratches and knocks when rattling about with keys or loose change in your pocket. With an Oota Core MTK system on chip processor running at 1.3GHz and 3GB of RAM the Ulefone Power make full use of its 6050mAh battery to bring a lightening quick performance. Now you can enjoy the latest games and the phone will handle all your demands with complete ease. You get a substantial 16GB of onboard storage and with Micro SD card support its simple to add an extra 128GB meaning you'll never be short on storage space. Android 5.1 brings you a tried and tested interface but with all the added functions such as smart wake, gesture sensing, smart motion and fingerprint scanning its easier than ever to use and has plenty of bonus features that will be sure to impress. Another of the Ulefone Power's special functions is the IR remote control that lets you adjust thousands of popular electronics such as TV, DVD players, air conditioners and other home appliances. Sporting a huge 6050mAh battery means that Ulefone power address the needs of heavy users who find themselves on the go a lot. For faster charging times the phone uses Quick Charge technology meaning it can be fully recharged in just a couple of hours, and after a short charge of just 5 minutes you could benefit from up to 2 hours of talk time. When fully powered up you can chat nonstop for days on end thanks to this super battery and charging technology. This is awesome, everything is just as advertised. Well done Chinavasion.